In 1945, after a chance encounter with Disney at a cocktail party in Hollywood, Salvador Dalí was invited to collaborate on a short animated film entitled Destino. The project was eventually terminated in its preparatory phase, but a whole array of conceptual paintings (executed by Dalí himself) remained in the Disney archive, and, in 2003, the Walt Disney Company hired a team of French animators to complete the film based on the surviving sketches. This was the version that toured in a number of highly publicised exhibitions, including the retrospective ‘Dalí and Film’ staged at the Tate in 2007, among other international venues. I’m not going to talk about this particular film, which is less interesting in my view than anything produced by the two figures independently. Instead, taking the collaboration as evidence of some mutual interest or affinity, I’m going to stage another retrospective (largely theoretical) encounter. We know that Dalí was an enormous fan of Disney cartoons. In 1937 he wrote an article for the magazine Harper’s Bazaar in which he praised certain examples of popular film-making in Hollywood, making special reference to Disney, Cecil B. DeMille and Alfred Hitchcock, his future collaborator – in the dream sequence for the film Spellbound (1945) (see Dalí, 2007:155). 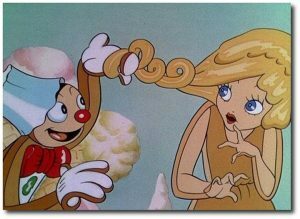 He especially admired the Silly Symphonies: a series of short-length animated cartoons (lasting between 6 and 8 minutes), produced by the Disney Company between 1929 and 1939. In one of these films, entitled The Cookie Carnival (1935), the characters are portrayed as live cakes and sweets endowed with human features and costumes. This is an example of where Disney’s sentimental imagination presses the limits of good taste; and it’s not hard to imagine why Dalí might have been taken with such mobile phenomena. Recall Dalí’s notion of the ‘psycho-atmospheric anamorphic object’, which he explored in his series of paintings of melting watches—these had in turn been influenced by Dalí’s encounter with a soft-cheese as he was in the throes of trying to complete a Still Life. 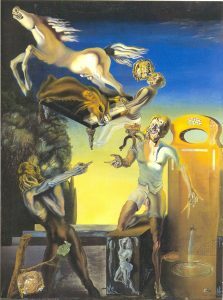 (see Dalí, 1998: 244-8). We might conclude that one of the shared strategies of pictorial surrealism and popular animation is a transformative approach to the simulation of material, whereby the limits of physical matter are subject to a perpetual state of transformation and collapse. Before we can proceed with this analogy, however, we need to acknowledge the obvious contradiction posed by Disney’s influence on Dalí or vice-versa. Surrealism was a ‘revolutionary’ movement in twentieth-century art. The Manifesto by André Breton, published in 1924, states quite clearly that the intention behind the movement is to liberate the unconscious from the bourgeois rationalist world view and, in doing so, to activate radical social change. The Cookie Carnival, 1935, dir. Ben Sharpsteen (film still). Current judgement of Disney’s oeuvre has tended to be informed by retrospective knowledge of his political sympathies, especially his McCarthyite views; he testified to the House Un-American Activities Committee in 1948, denouncing some of his own former employees. Many critics have emphasised the consistency between Disney’s rabidly conservative political views and the form and aesthetic of his films and products—which tend towards a sentimental ‘hyper-realism’. In the light of these observations, the whole notion of Disney’s collaboration with Dalí seems contradictory even absurd. However the link becomes more plausible if we acknowledge the negative view of Dalí himself, as articulated by Breton, Clement Greenberg, George Orwell and other left-wing writers and theorists (see Ades, 2004: 20; Greenberg, 1988: 225-6). Dalí has always been the problematic figure in the official history of Surrealism. 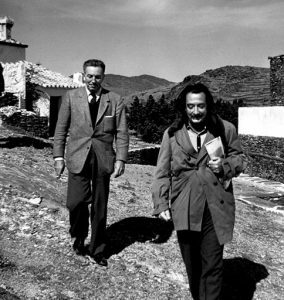 By the end of the 1930s, André Breton had expelled Dalí from the movement. His nickname, ‘avida dollars’ was a cruel anagram of Dalí’s name—intended to draw attention to his commercial priorities. By then, Dalí had begun to collaborate with the worlds of fashion-marketing and advertising, producing window displays for Bonwit Tellers and an installation for the New York World’s Trade Fair, among other ventures. Breton felt that Dalí’s painting, whilst showing promise in its early years, had degenerated into a vulgar pastiche of classicism. And he was offended by Dalí’s political views, his tacit support of Franco in the aftermath of the Spanish Civil war and his flirtation with the culture of Fascism. Dalí’s clouded reputation points toward a striking similarity with Disney. Both men have been portrayed as suffering a “fall from grace”, possessing an avant-garde potential in their early careers which later became squandered through their commercial interests. This narrative can also be applied to Disney. The earliest films produced by the Studio, such as the first Mickey Mouse cartoons and the aforementioned Silly Symphonies, were admired by Marxist intellectuals like Walter Benjamin. The soviet director and film-theorist Sergei Eisenstein wrote famous treatises on Disney animation, in which he evoked comparison to the work of Picasso and Dalí (see Eisenstein, 1988: 10). Eisenstein was also a great fan of Snow White and the Seven Dwarfs (1937), though this film is often regarded as the negative turning point in the studio’s artistic development. In Snow White we find all the negative attributes of the Disney house-style (judged according the values of avant-garde modernism). 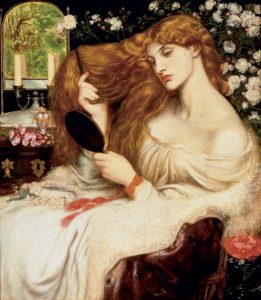 The film’s pictorial language is rooted in the tradition of late-nineteenth-century figurative painting and graphic art, especially Symbolism, the work of the Pre-Raphaelites and Art Nouveau. We can understand why Disney was so heavily criticised for returning to the aesthetics of the past, when we recall that certain forms of backward-looking kitsch were also being deployed by oppressive autocratic and anti-semitic regimes during this period. Adolph Hitler hated modern and expressionist art and favoured neo-classical styles of painting and sculpture. He admired Disney’s Snow White for its Bavarian folk imagery—which echoed his own idealised vision of an authentic Germanic past (see Leslie, 2004: 153). However not all the artists who looked to the past for inspiration, during the 1920s and 30s, were those with fascist or totalitarian sympathies. The Surrealists were drawn to the late-nineteenth century, owing to the impact of psychoanalysis and the study of mental illness on the art and culture of that period. The art of the Fin-de-Siècle often engaged with irrational fantasies and dream images, and this aspect was affirmed by the Surrealists’ frequent citation of nineteenth-century painting and applied art. André Breton extolled the work of the symbolist painter Gustave Moreau in his book on Surrealism and Painting (see Breton, 1972: 363). Dalí was greatly indebted to the English Pre-Raphaelites, such as Dante Gabriel Rosetti (see Dalí, 1998: 311-12). Most famously he was inspired by art-nouveau architecture, such as that of Antoni Gaudí. It’s likely that Dalí was driven to produce paintings such as The Persistence of Memory (1931) (in which solid objects appear to be melting out of shape), after looking at the convulsion of form in Gaudí’s buildings (and art-nouveau design more broadly) (see Dalí, 1998: 193-201). We can thus begin to understand how the creative link between Dalí and Disney might be owing to shared sources of historical influence. Bearing these sources in mind, how should we regard the psychoanalytic legacies of these cultural forebears? We might not immediately be inclined to credit Disney with an interest in the “dark side of the unconscious”, though one-or-two of his most iconic works engage in themes and images that are close in spirit to the psycho-sexual narratives beloved by surrealist painters and writers. Snow White is a story of violence in the family. Both Dalí and Disney had troubled relations with their respective fathers; in Dalí’s case this led to a whole array of paintings in which the filial subject is threatened by obscene figures of authority. Disney’s exploration of such complexes (as in Snow White) tend to be dominated by figures of the ‘bad mother’. But there are ‘bad fathers’—or bad father-figures in Disney too, most famously in Pinocchio (1940), the very surreal account of ‘a live puppet without strings’ and his exploitation at the hands of ruthless older men. The presence of these images in Disney’s oeuvre may help us to understand why Dalí reserved a special admiration for this Hollywood film-maker (whose saccharine sentimentality has otherwise proved so offensive). The precise explanation of that sympathy remains elusive; the enigma of Dalí’s affection for Disney lurks in the shadow-side of Surrealism, its encounter with money, politics and desire. Ades, Dawn. Introduction to Dalí: the Centenary Retrospective. ed. Dawn Ades. (London: Thames and Hudson, 2004): pp. 17 – 23. Allan, Robin. Walt Disney and Europe: European Influences on the Animated Feature Films of Walt Disney. (London: John Libbey, 1999). Breton, André. Manifestoes of Surrealism. trans. Richard Seaver and Helen R. Lane. 5th ed. (Michigan: University of Michigan Press, 2010). _________. Surrealism and Painting. trans. Simon Watson Taylor. (London: Macdonald, 1972). Dalí, Salvador. The Collected Writings of Salvador Dalí. ed. and trans. Haim Finkelstein. (Cambridge: Cambridge University Press, 1998). __________. ‘Surrealism in Hollywood’. trans. George Davis. reprinted in Dalí and Film. ed. Matthew Gale. (London: Tate, 2007): 154-156. Eisenstein, Sergei. Eisenstein on Disney. ed. J. Leyda. (London: Seagull Books, 1993). Leslie, Esther. Hollywood Flatlands: Animation, Critical Theory and the Avant-Garde. 2nd ed. (London; New York: Verso, 2004). Silverman, Deborah. Art Nouveau in Fin-de-siècle France: Politics, Psychology, and Style. (Berkley: University of California Press, 1989).